Last week The Sustainable Angle’s Amanda Johnston was invited by GLE ONE London to hold an interactive sustainable materials and sourcing workshop. 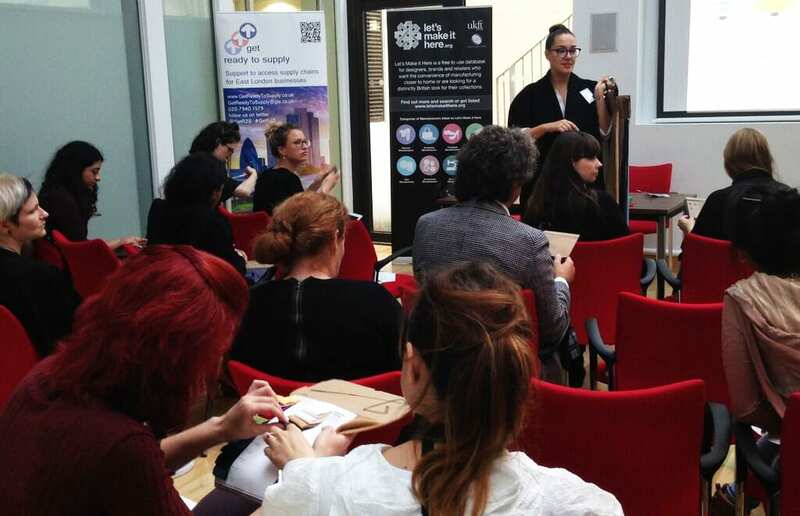 The workshop was hosted by UFKT (UK Fashion & Textile Association) at their Headquarters in Holborn. Aimed at London based designers and brands the free workshop was initiated to focus on sustainable materials and sourcing, exploring the textile value chain and market. The workshop started by discussing the textile industry’s overall ecological footprint and social impact, touching upon areas such as the textile industry being the number two polluter of clean water in the world, in times when clean water is a scarcity. We also stressed the industry’s over dependency on conventional cotton and polyester, and how we will need to think in a different way to be able to meet the global demand for textile fibres in the future. The workshop aimed to provide essential information for ensuring a socially and environmentally responsible supply chain, and tips and guidance on how to start sourcing more sustainably. We highlighted some of the industry’s most urgent issues and obstacles, and invited the audience, consisting of London based SME’s, to share their own experience, and concerns about the future of sustainability in textiles. The day provided the opportunity for young designers to get an overview of the current textiles landscape. Highlighting possibilities, strategies and tools for businesses to take the lead and change the way in which the textile industry operates. The workshop covered everything from certifications and tools through, evaluating and finding fabric suppliers to the latest textile innovations with a lower environmental impact. We rounded of the day by sharing some of our latest sustainable material innovations, those already available and some of which are currently in development in order to encourage future thinking when it comes to sustainable sourcing. As with all of our events there were a large selection of sustainable materials on show to illustrate the increasing range of commercially available materials on market today, as well as numerous innovations highlighted in the presentation. We are continuing to expand our collection of over 1,500 sustainable materials and you can discover a curated selection online and the full selection of fabrics with a lower environmental impact at the Future Fabrics Expo, London, 25-26th January 2017. REGISTER NOW!